McDonald saheb, Qureshi saheb, Jivan Singh, Aadal Singh, Udham Singh …. Eighty-yearold Lakshmi Nishad rattles off all the names she remembers of the forest officers who have served in the Gorakhpur range. The display of memory is a desperate attempt to prove that she has lived all her life in this forest area of Uttar Pradesh. If she can prove this to the government, Lakshmi will be recognised as a citizen of India. If not, she will continue to live a legally nonexistent life like many others of the Taungya community. Her village Tilkunia also faces the threat of being officially unrecognised. More than 100,000 Taungyas have been branded illegal forest-settlers. The forest department does not recognise them, nor does the revenue department. The community’s presence dates back to the British time (see ‘Orphaned by apathy’, Down To Earth, October 31, 2002). They were hired as bonded labourers to plant trees in degraded forests of Uttar Pradesh. Land would be allotted to Taungyas for five years where they would plant trees and take care of them. They were allowed to cultivate the land around the trees. After five years, they would have to move to another patch of land allotted to them. In the 1980s, the forest department stopped the practice. It asked Taungyas to sign an agreement. They could cultivate the land allotted to them only till the fiveyear period ended, and were barred from using forest produce. They became encroachers overnight. Attempts to evict Taungyas met with protests and plans to resettle them made no headway. Taungyas cannot get below-poverty- line cards. They cannot even avail of bank loans. “We have seen other villages develop after Independence. 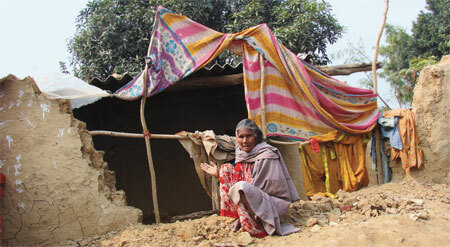 But we remain where we started,” rues Kailash Nishad, who lives in Rajahi camp, another Taungya settlement. The Taungyas have now pinned their hopes on the Forest Rights Act (FRA) of 2006 in getting legal identity. The FRA mandates converting forest settlements, such as Tilkunia, into villages. It recognises the traditional rights of scheduled tribes and other forest-dwellers on forest land and resources. “If I get legal recognition, I will get old age pension. I can then get my mud house repaired,” says Lakshmi. In 2009, more than 4,500 Taungya families of Gorakhpur and the nearby Maharajganj filed claims for ownership of the land they were living on. But the government rejected them on the ground that they have not lived in forests for 75 years. To claim land ownership a nontribal must have lived in forests for at least 75 years prior to 2005. Taungyas have always been on the move and do not have records to show this. “The sub-divisional level committee (SDLC), formed under the FRA, approved the claims four times. But each time, the district level committee (DLC) rejected it at the behest of the forest department,” says Vinod Tiwari, director of Vikalp, a non-profit based in Gorakhpur. Taungya is a Burmese word meaning cultivated hill plot. This method of planting trees was widely prevalent in Burma, now called Myanmar. 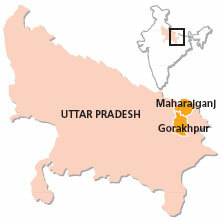 Fascinated by it, the British adopted it in Gorakhpur in 1921-22 and later in other districts of Uttar Pradesh. The labourers were eager to join the fold as they were fed up with the begar (work without pay) system. These labourers were named Taungyas. The Sal forests they planted are still considered the best in the state. Their efficiency fetched them support from British officers who provided them healthcare and education. The system continued after Independence. After terminating the system, the forest department served eviction notices to the community and conducted raids in 1983. Angry, Taungyas clashed with the department officials. The face-off reached a flashpoint in 1987 when two members of the community were shot dead by department officials. The court convicted the officers and stayed the eviction notice. “To resettle them government made proposals in 1999, 2000 and 2002. But none could materialise. Neither the forest department nor the revenue department was ready to give away land,” says Ravi Shrivastava, a lawyer fighting for the rights of Taungyas in Gorakhpur. “According to the forest department’s working plan, the Tilkunia range was established in 1937. There is no documentary evidence of Taungyas being settled there prior to that. Since it does not count 75 years before 2005, the claims cannot be approved,” says R S Singh, sub-divisional forest officer of Bansgaon tehsil in Gorakhpur. He recommended rejection of 563 claims filed in Gorakhpur in December 2010. Around the same time, the DLC recommended approval of 3,936 claims in the adjoining Maharajganj district. But it retracted the approval soon after the rejections in Gorakhpur. Protests led to formation of another committee in March to investigate 75 years of occupation of land by Taungyas. It is yet to take decisions. “We have provided all evidence to the SDLCs and the DLCs. Now it is their job to decide claims. For us, Taungyas are encroachers unless regularised,” says D N S Suman, principal chief conservator of forests in Uttar Pradesh. For Balvinder Kumar, principal secretary, Social and Tribal Welfare department, the decision depends on the forest department’s approval. “The claims can be accepted only if the forest department approves that Taungyas fulfil the condition of 75 years of occupation on forestland prior to 2005. After all, it is the forest department’s land,” he says. The community is angry. Taungyas say the forest department deliberately suppressed facts. “Our ancestors planted trees during the Chauri Chaura incident of 1922,” says Devilal Nishad of Rajahi Khale settlement. “The range officer used to record details of land allotted to each worker. When we asked for names of workers who were allotted land between 1922 and 1930, they said they did not have old records. They are lying to deprive us of our rights,” he adds. The forest department fears the land where the community has planted trees will slip away from its control, says Roma of Kaimur Kshetra Mahila Mazdoor Kisan Sangharsh Sangathan, a non-profit in Uttar Pradesh. “More than 50,000 hectares of the best quality Sal trees in the state have been planted by Taungyas. The FRA gives them right over these forests,” she says. The forest department is not dedicated like the Taungyas, says Vinod Tiwari of Vikalp. It plants trees just to utilise the grants. Not one Sal tree was planted in the region after the community was told to stop doing so in 1985, he adds. Reporting the apathy of the people from ground zero, brings to light the callousness of the government athourity. A very well researched article.